I am looking for a short 3 day getaway for my family (teen boy, teen girl, and husband). I have saw your stuff on the Elk - then I saw your stuff on Lake of the Ozarks. I was wondering if you would give me a few places to think about going for an October Getaway? October is a perfect time to travel - as here in Missouri we FINALLY start to cool down! Yay for Fall weather! The Elk stuff you just saw was actually located in Saint Louis, Missouri - the park is Lone Elk Park. Great place with a great driving tour. I would be happy to suggest a few places to visit in St Louis - Just let me know. As for Lake of the Ozarks - The Lake is always a good time for families. Truly an all American Vacation! I do suggest finding a condo to stay in ( I would do that first). I have stayed at Eagle's Nest Resort at Sunset Beach and Point Randall Resort in the Lake of the Ozarks - both are perfect for families. You may want to stress to the person you give your reservations to that you have a boy and a girl - some have 3 bedroom condos, some just have couch beds. At both of these locations you will also have a kitchen, that could save you some money on meals. When you call them tell them that Becky - The Missouri Mom sent you and tell them hello from me! great photos of your family at the castle remains. Ha Ha Tonka - has several hiking trails, I have hiked them - they are in great shape, but pack your hiking shoes! Lake of the Ozark State Park - I never leave an area without visiting the State Parks - such an IMPORTANT asset we have in our state. Lake of the Ozark State Park offers so much - hiking, swimming, fishing - the list goes on. You may catch it warm enough to get in some early fall swimming - the beach here is very nice! Shopping - you mentioned teen daughter, so you must like to shop! Ha Ha! Lake of the Ozarks has some amazing shopping with amazing prices - I got some killer deals last year just before Christmas - so plan ahead! Osage Beach Premium Outlets has something for everyone - while you are there, you could pick up some hiking shoes for those hikes at the parks. There is also an area called Bagnell Dam Strip - that is similar to shopping in on the main strip in Branson - to be frank I LOVED The Strip, but only spent like $10 on candy! This would be a great area to pick up small trinkets, gourmet candies, and have ice cream - there is also a small arcade in the strip - the teen boy may love that. The Landing on Main Street is the Lake's most popular shopping place - Main Street Music Hall is located here also (read below about the music hall - I would consider this high end, although the prices are not terribly bad - they do have high end gifts, pampering items, and much more! Main Street Music Hall - completely family friendly, I would not hesitate taking anyone to Main Street Music Hall. Great music - Great performers - you will just have to see it for yourself! Bridal Cave - the legend is Native Americans once performed marriage ceremonies inside Bridal Cave - either way this is place is STUNNING and perfect for all ages! They do have a great little gift shop also - I always grab myself a bag of rocks! Oh and pack $10 or so dollars in cash, they do a family photo for you inside the cave - you will want to keep that for your scrapbook. Tropic Island Cruise - If you truly want to see the beauty of the Lake - I suggest jumping aboard with Captain Omer - unfortunately you kids are probably too old to drive the boat (he usually says 12 and under), but you could always ask - perfect photo moment. The cruise takes you around the lake, you will see beautiful homes, some pretty neat boats, and test out your sea legs - drink water it helps with motion sickness if you struggle with that. Miner Mikes/Busters - now I have not been to Busters, only Miner Mikes as I have smaller kids. However, I have peeked in there and the place looks very cool. They are an arcade/fun center - this would be a great stop if you get trapped by rain. Dining out - I can assure you that you won't go hungry at the Lake. Larry's on the Lake - this is a fun little marina style resturarnt - great food, live band, and they often have special events - I will say this is a bar area, so if you are looking for family dinning, go early! Tonka Hills Restaurant - is also a great choice, be ware their full order of gravy and biscuts is about double the order of most places! So go hungry! Here is a link to Lake of the Ozarks dining guide - I have ate at several places there - too many to list! I will add Lake of the Ozarks is located in Central Missouri - meaning there is SO MANY things surrounding it. to visit and is an open military post with 5 museums on post. FLW is also located in Pulaski County, Missouri - another great stop for sure - I suggest if you go, stop in at their visitors center and ask for maps and tips - again tell them Becky sent you and hello from me. In Pulaski County, my top day stops is The Talbot House Antiques - ask him to play his barrel piano for you! The piano is not near as cool as watching the guy play it - he is a HOOT! I also believe they do a haunted tour of the house sometime in October - it might be fun. The Old Stagecoach Stop Museum is a must see in Waynesville - Great history, and this museum is put on by volunteers - all the more reason to stop. Lunch and diner options in Pulaski County - there are several, but my favorites are Di Trapani's - great Italian food - oh and the view is stunning! Sweetwater BBQ - this is a quick BBQ place with tons of options, and in Waynesville there is also a neat little hotdog/ice cream shop on what they call the "square" in Waynesville - the hot-dogs are scrumptious! 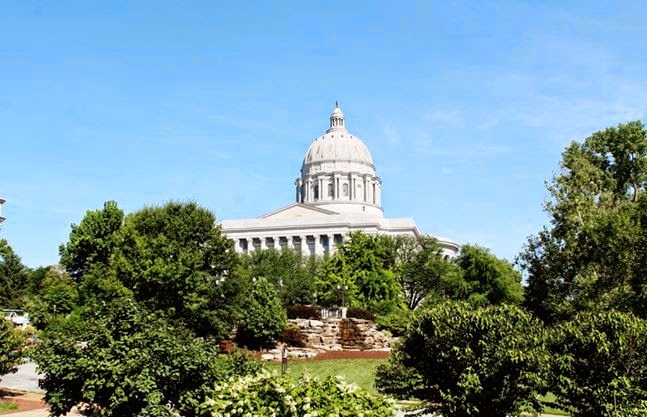 About a 45 minute drive from Lake of the Ozarks is Jefferson City, Missouri - you know the Missouri State Capital. Jefferson City is another place absolutely loaded with family fun - it is not all white shirts and ties. My favorite thing to do in Jefferson City is to tour the Missouri State Penitentiary - if your kids are older than 12, I highly suggest this. I will warn you there has been ghost sightings at the prison - this should get you in the mood for Halloween! You may also know that historic section of Jefferson City is amazing, many of the buildings including the Capitol Building is Free to visit! Dining in Jefferson City is great - in the downtown area they have a several great choices. Prison Brews is always good if you are in the "prison mood" or Madison's has some great Italian food also - wear your stretchy pants. Oh and you must stop at Central Dairy, their ice cream is beyond yummy - it is delicious. You may also like to check out Downtown Jefferson City's Art Stroll - I am not sure if they run through October or not, but if they do this is GREAT family entertainment and it is FREE. You will see live performance, taste yummy food, and have some big laughs. I hope I have not overwhelmed you - I just wanted to give you lots of options. As you can see I get a tad carried away when it comes to vacation! If you have any more questions feel free to ask - I will be glad to help.